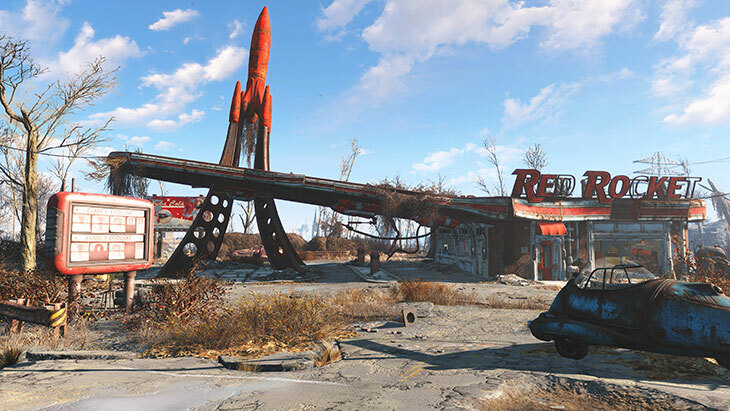 Defending Red Rocket gas station from a Raider attack feels fun, but does VR have a place in the world of Fallout? 2016 was for a long time advertised as being set to be the year that virtual reality would gain a proper foothold in the world of gaming. Though the year so far has been characterised by rocky hardware launches and a limited amount of software, Bethesda used this year’s E3 to become the latest publisher to throw its weight behind the burgeoning new medium. It was one of the bigger surprises in its press conference, one of the few things that hadn’t been nodded to by various leaks. Available immediately after the conference were hands-on stations for VR versions of both DOOM and Fallout 4, both using the HTC Vive as their headset of choice. I got to have a little time with both demos, though it’s worth noting that DOOM is, at least for now, merely a tech demo, a proof-of-concept. 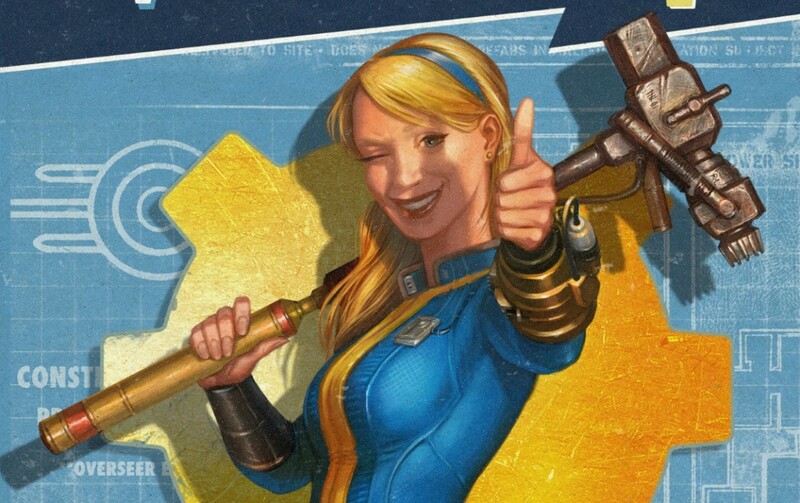 Bethesda reps wouldn’t be drawn on if it was likely to become something more at some point down the line. The demo takes place in a small but familiar spot. Fallout, on the other hand, is more real. Bethesda considers Fallout 4 VR an ongoing announced title in development, something reiterated when it got a mention in the Scorpio section of Microsoft’s press conference. It’s a real release you may someday own, then, but it’s also extremely early. The demo area is small, limited to the familiar Red Rocket gas stop that’s near Sanctuary Hills, the first place you visit in the game. Fallout 4’s vision of a post-apocalyptic world looks great through the headset even though it isn’t graphically reaching for anything like photorealism. I’m not going to say that being in VR makes the game more visually appealing, but it certainly is transformative to the experience; it’s not necessarily better, it’s just different – though in a demo this constrained it’s difficult to draw a true opinion anyway. It’s at this point I must stress just how simple and limited this demo is; you’re confined to this one area of the wasteland, and you’re basically in a very simple scripted scenario: First, you take on some target practice against inanimate objects. In short order a scripted raider attack begins, thus allowing you to get stuck in to the combat side of things. While you can of course turn in place and make minor adjusting movements thanks to the Vive’s tracking, broader movement is handled by using your left-hand Vive controller to point-and-click towards where you want to go. Obviously this is a clunky way of moving and this is the first thing that really gives off the strong impression that this is an extremely early and experimental project. You point, you click, and your Vault Dweller will essentially teleport a short distance to where you were pointing. In this moment it’s hard not to think that the experience would be better with a controller, but in other ways the use of the Vive’s motion-sensing controllers makes more sense. Take looking at your Pip Boy, for instance – because Fallout characters wear the device about their wrist, rather than pressing a button to open it you simply have to raise your left arm into your field of vision and there it is, on your wrist in the VR world. There’s a novelty to this that’s satisfying, at least in the confines of a 10-minute demo – though even then there’s something a little early and janky about it all in that there’s no vault dweller arm attached to the Pip Boy – it just hovers about in mid-air. Being able to glance down to it with a tilt of your head and a raise of your arm is useful and satisfying, however, and that feels right at home alongside what your right hand gets up to – the business of shooting. In the demo you’re limited to a 10mm Pistol with infinite ammo, an obviously early-on solution to the question of how you handle reloading in VR. There’s a tactile sense given to the combat by VR. Both from the immersion the headset offers and from having one-to-one tracking with your pistol. It’s possible to reach around cover to blast enemies without properly exposing yourself, for instance, and given that Fallout 4 is a game that isn’t exactly the tightest shooter to begin with (something alleviated by VATS), this is actually a significant improvement. Even with the caveats of how obviously early it all is, the shooting felt great. Not being able to tickle Dogmeat’s tummy in VR seems like a missed opprtunity. That’s the back-and-forth of this demo. The shooting feels great, but object interaction – picking things up and the like – isn’t present, presumably because it hasn’t been worked out yet. 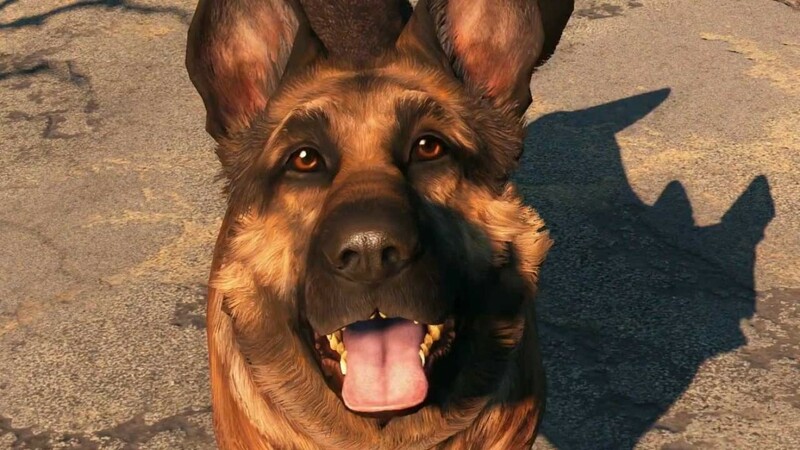 The immersion is there visually, but when Dogmeat dances around your legs as an excitable pup should, you sadly can’t actually reach down and interact with him. If you do reach out and prod him with your gun-arm, there’s no reaction, and that breaks the illusion more than a bit. Fallout 4 VR is something I’m surprised Bethesda put out there in a hands-on capacity as it is still so obviously early. In that sense they deserve to be commended; it’s a brave move, and this is the sort of thinking and investment that VR is going to need to eventually work for large-scale titles like the first-person RPGs Bethesda is best known for. 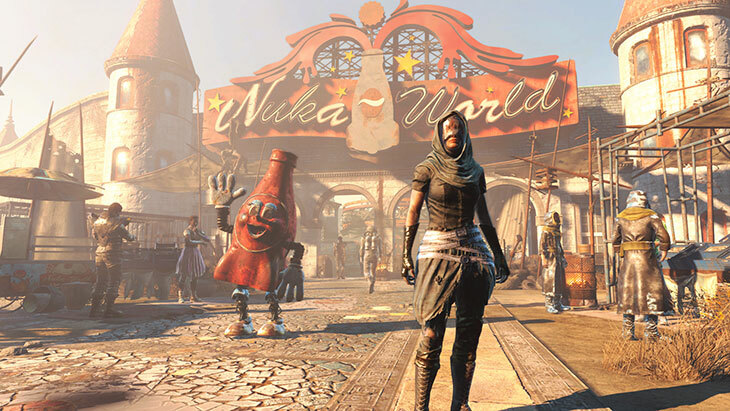 As it stands now, the demo isn’t even a promise of that, as it isn’t even approaching a state where much of Fallout 4’s feature-set could be integrated. It’s an interesting curiosity, however, and perhaps an interesting insight into where Bethesda sees gaming going in the more distant future. The problems faced in porting Fallout 4 to VR are ones that, one way or another, will have to be solved. This demo represents at least this studio’s intriguing first tentative baby steps towards that.